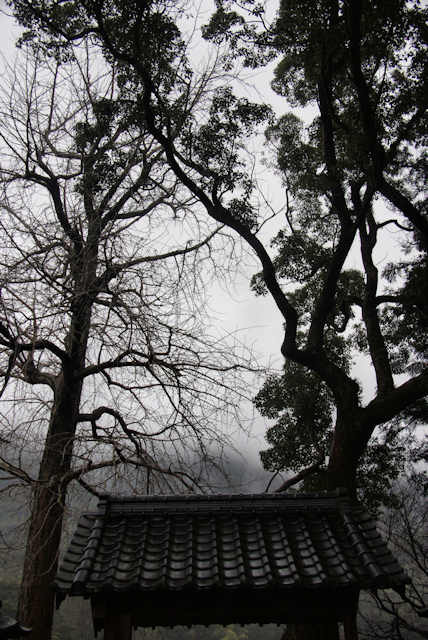 The ninth day was rainy. Not showery, but dark and overcast and incessant. Devoid of color. and while not a downpour it rained enough and was cold enough for the dampness to penetrate. 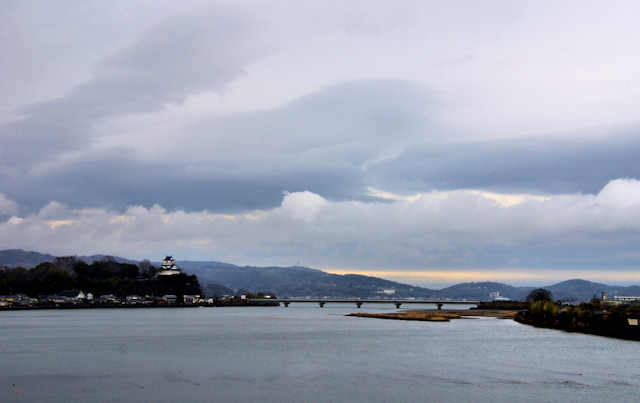 My route skirted the Kunisaki Peninsula, following the main road and rail line and rather than spend time looking around and enjoying the view I concentrated on walking quickly from shrine to shrine so I could take a break out of the rain. 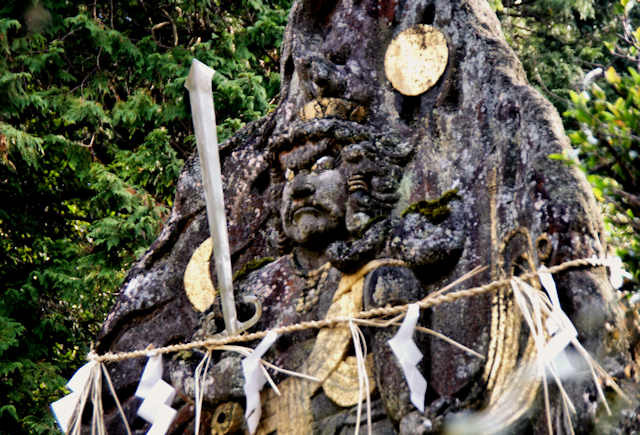 At one shrine I found some interesting komainu, at another a pair of faded photographs of the Showa Emperor and his wife. I woke before sunrise, the only person at the little campground in the scenic Jodogaura coast, and then headed north along the little coast road that was totally bereft of traffic. 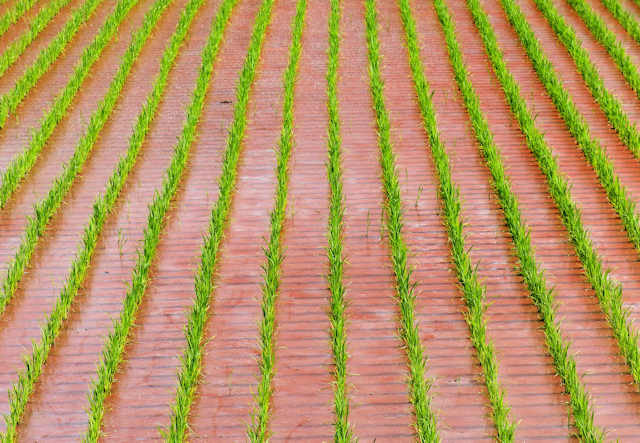 Afetr a while the road cut inland along a valley wide enough for many rice paddies where the young seedlings were on the way to fullfilling their potential. At the coast in Nakamura I found the little village store open and took my morning repast before carrying on north. 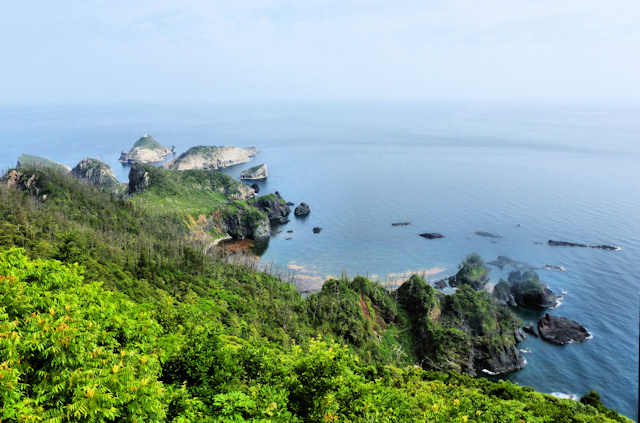 A steady climb to the northernmost point of the island and the overlook of the Shirashima coastline. From here I headed south into the interior of the island. After a short climb I began a long descent. The road was new, wide, relatively straight, and little traveled. 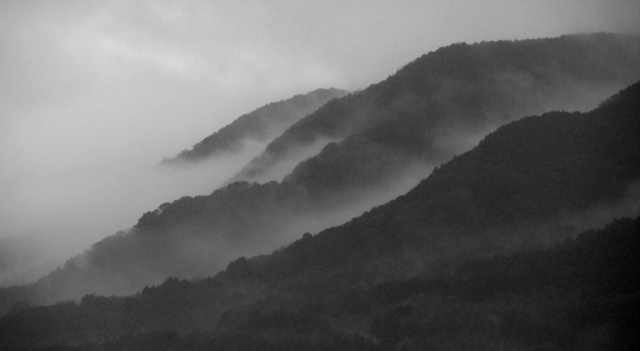 Every now and then I caught glimpses of the old road that meandered through the mountains. Quite a few k longer than the new road, it was probably a more enjoyable walk, but I had a room booked for tonight and so took the faster, easier route. 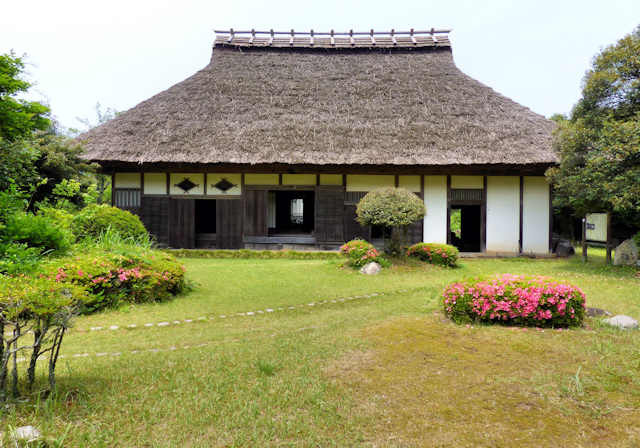 At the history museum in Kori I was surprised to find a lovely thatched farmhouse open to the public in the grounds behind the main museum building. 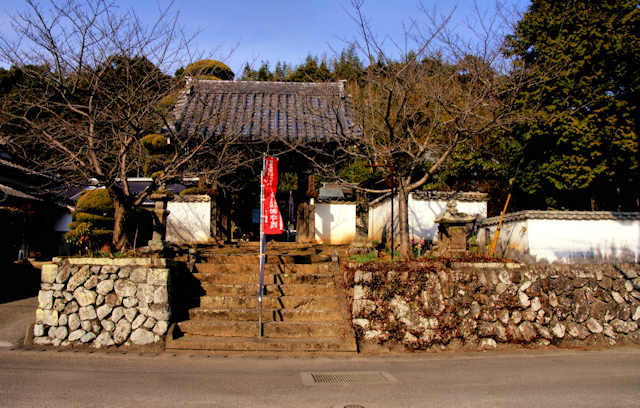 Dairakuji was founded in the 14 Century and is just across the road from Usa Hachimangu, to which it was connected. 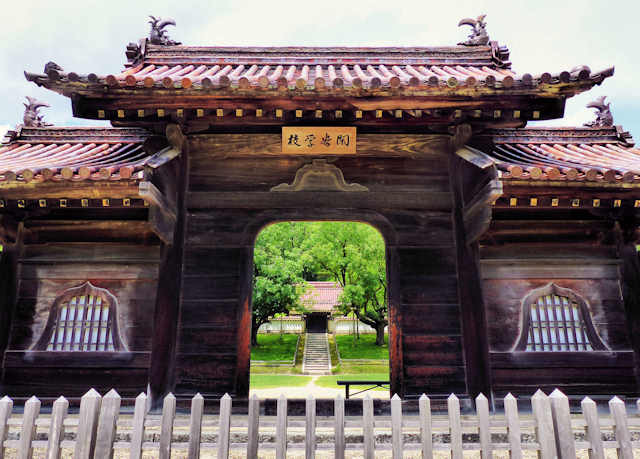 Usa hachimangu now appears to lie inside a massive park, but until the Meiji Period the grounds were filled with a huge number of shrine/temple buildings. 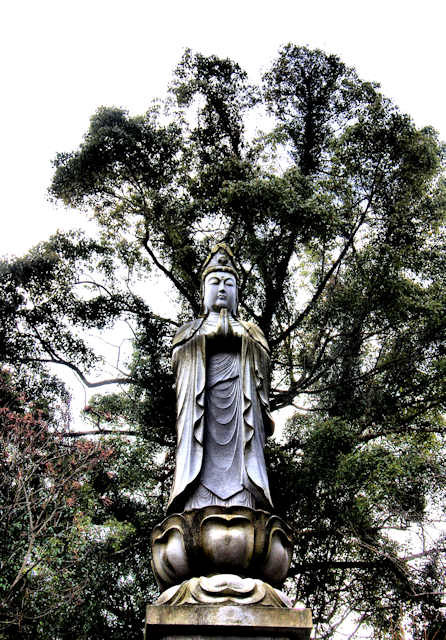 Old paintings show at least 5 pagodas. 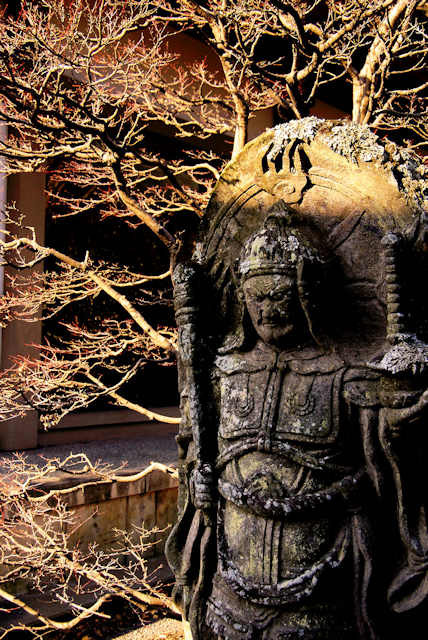 Dairakuji was founded as a family temple for one of the head priests of Usa Hachimangu, but when the Buddhist parts of the complex were destroyed some of the statues, many of which dated back to the Heian Period, were placed here in Dairakuji. I got here a little late in the day and was not able to get into the Treasure House, but there was still a lot of nice statues in the grounds. 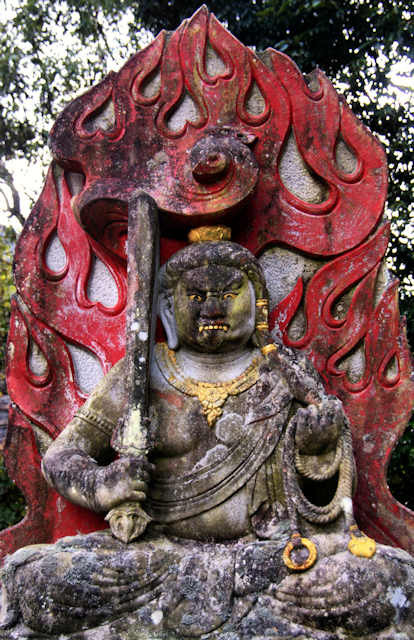 Including, like at so many of the temples on this Shingon pilgrimage, multiple versions of Fudo Myo. I am a huge fan of kagura, and have seen hundreds and hundreds of dances over the years, most, but not all, Iwami kagura from my local area. 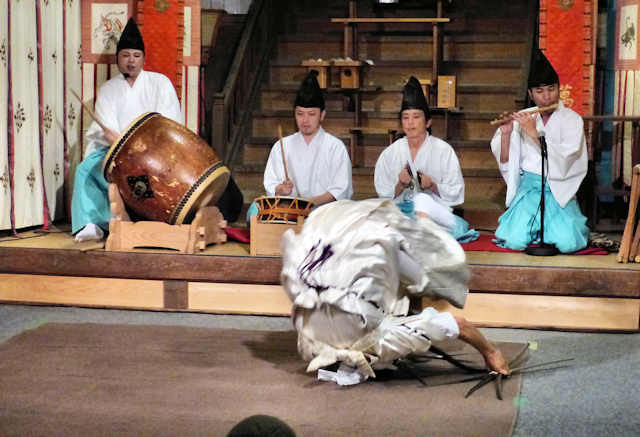 While it is still fascinating seeing the variations of dances that different groups perform, it is nowadays rare to see a dance that I had not see before. So it was with great anticipation I saw something at a performance by a kagura group from down near Masuda. 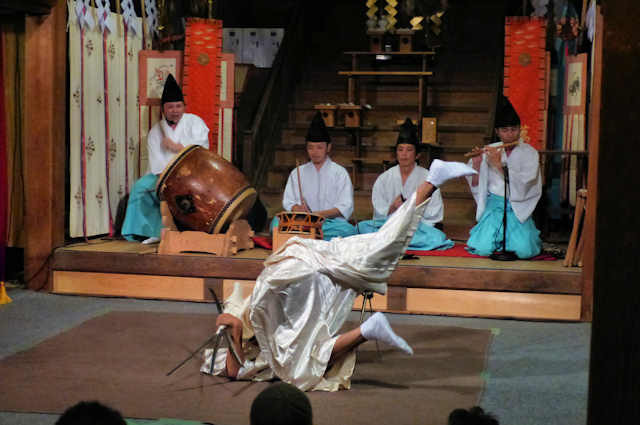 There are basically two types of dance, masked-theatrical which was in earlier times performed by the villagers as entertainment in between the shinji, ceremonial dances, usually performed by the priests. 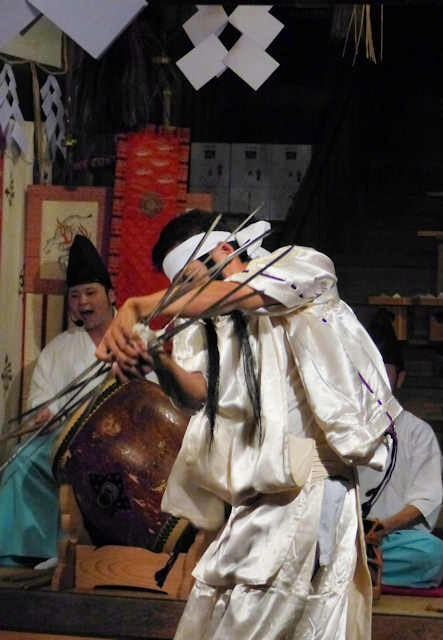 There is a lot of crossover between the two, one being the use of torimono, objects carried by the dancers. 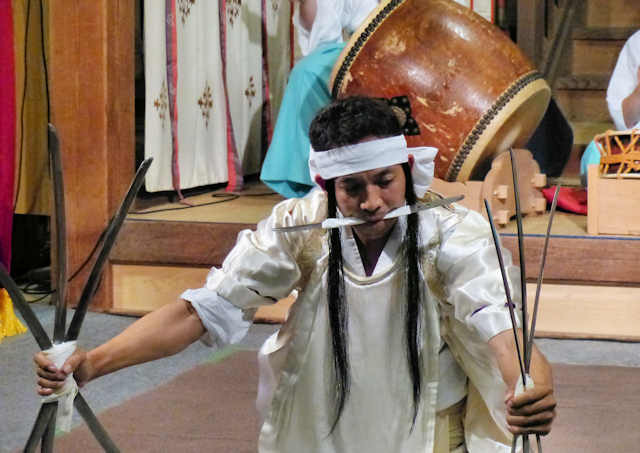 Swords are often used as torimono. 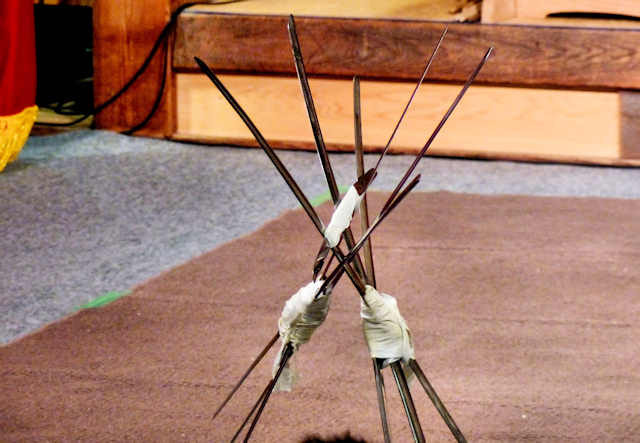 I had never seen this kind before, 2 groups of 6 blades, crossed over and held together with material so they could be held. These are real blades, maybe not razor sharp, but still dangerous. At first the solitary dancer performed with these blades in his hand. later a shorter, double pointed blade was held between his teeth while he danced. The finale to the dance was completely unexpected as the dancer started doing somersaults on the floor while holding all the blades. 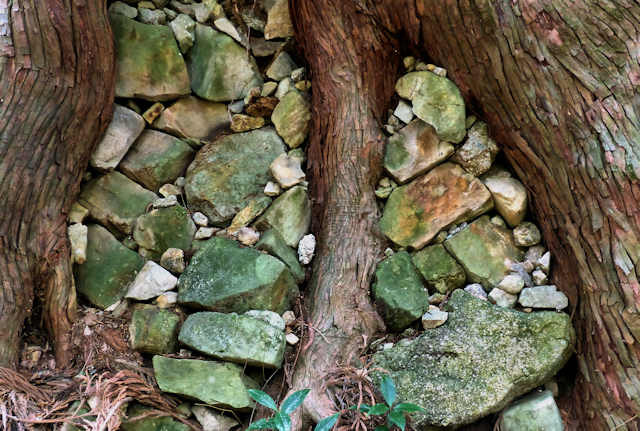 The roots of the dance is obviously with the shamanic, trance dances that are ultimately the origin of modern Iwami Kagura. 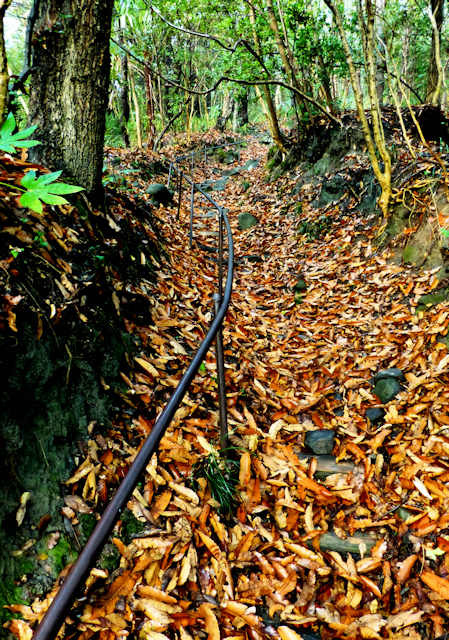 Daimonzaka is the slope that leads up from the valley floor towards Nachi Taisha Shrine, Seigantoji, and the Nachi Falls. Most people now take the modern road. 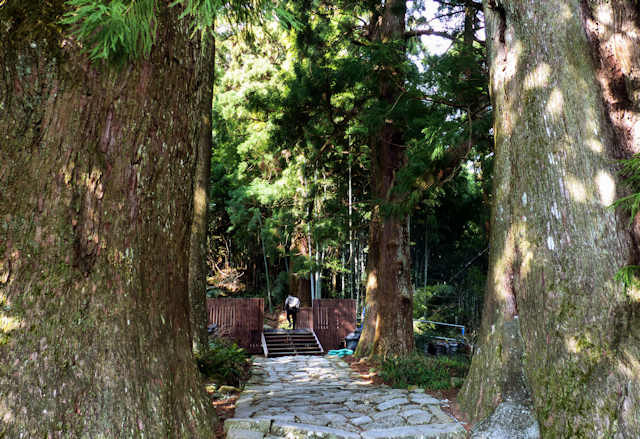 Daimonzaka means "Great Gate Slope", though the gate has long since disappeared, the path is flanked by huge trees, some 800 years old. 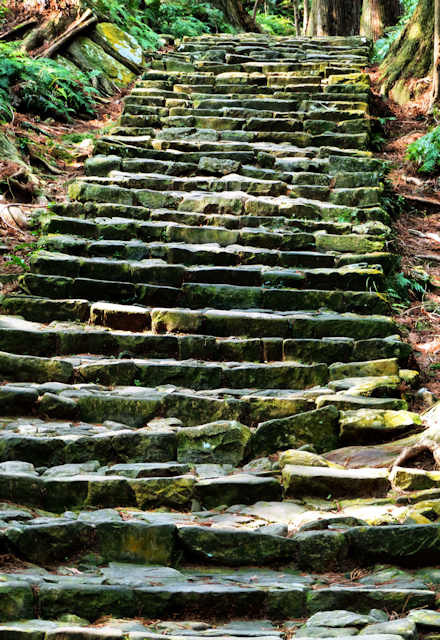 The stone staircase is 600 meters long and comprises of 267 steps. Near the base is shop renting Heian period costumes for cosplay photo ops. 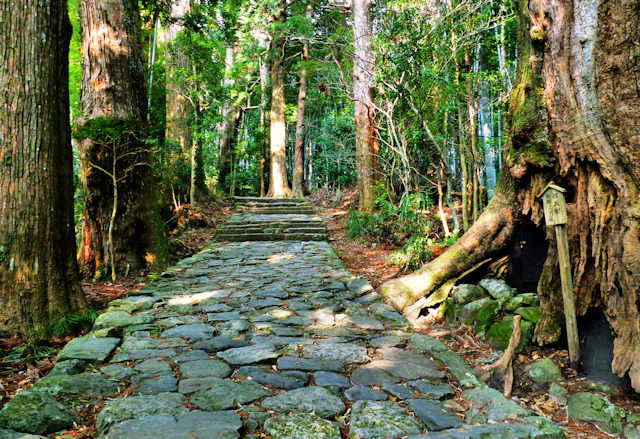 For those unable to walk the Kumano Kodo it offers an opportunity to experience the pilgrimage route. At the top the road heads down to the right towards the Falls or a further series of steps carry on up to the shrine and temple. 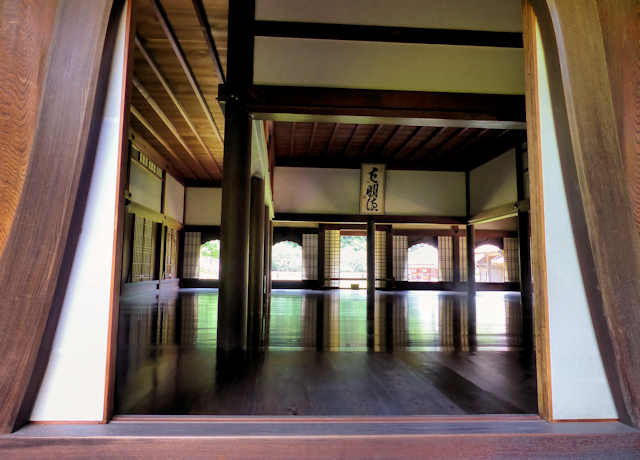 Jingo-ji Temple was a very pleasant surprise. 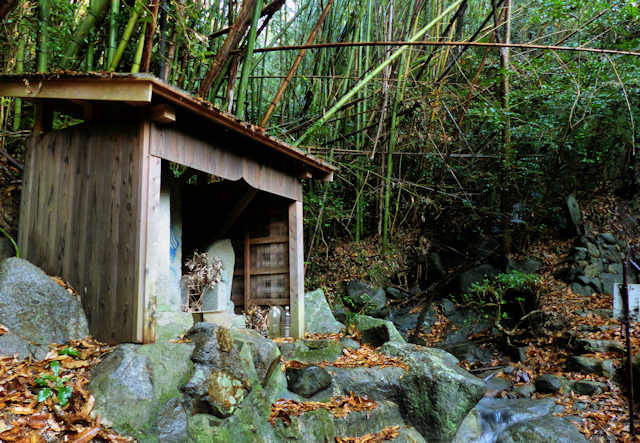 Number 21 on the Kyushu Pilgrimage, it is/was a Shugendo center based around 2 small waterfalls. 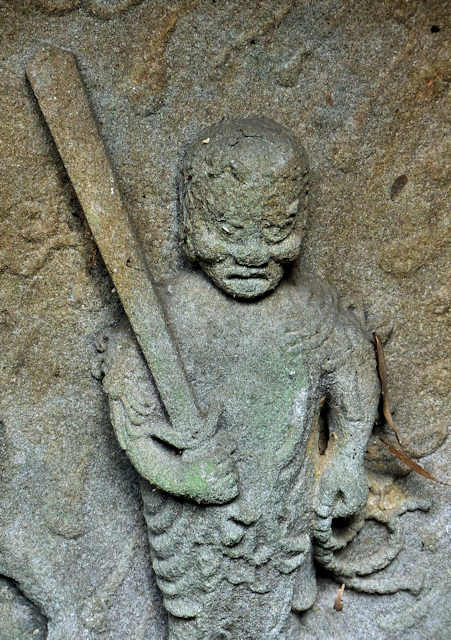 There was a lot of statuary, and while I am no expert, I have gotten better at identifying the myraid deities that inhabit the spiritual sphere of Japan. 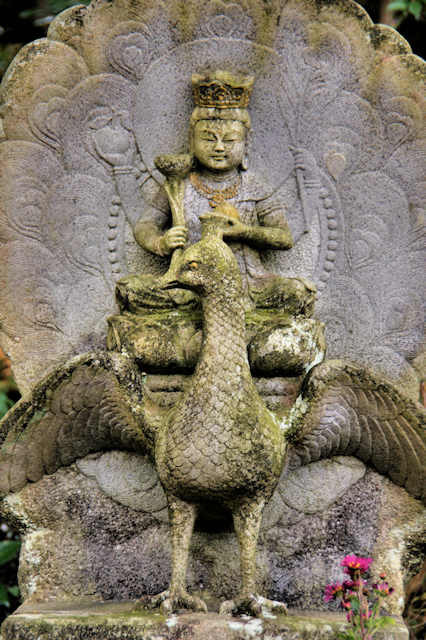 This first one, riding a peacock, is I think Amida, though I am not 100% certain. 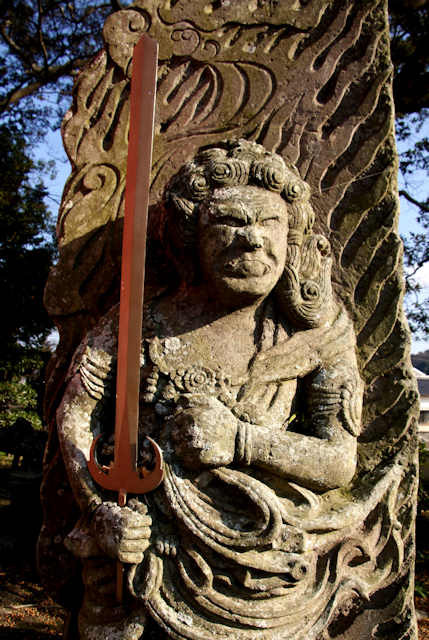 This is Enma, the head judge of Hell, sometimes known as the King of Hell. 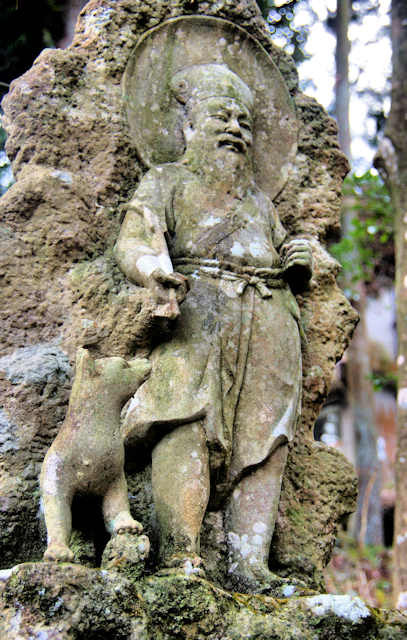 In premodern times the deity Inari took many forms, but a common one was as an old man accompanied by a fox or foxes. 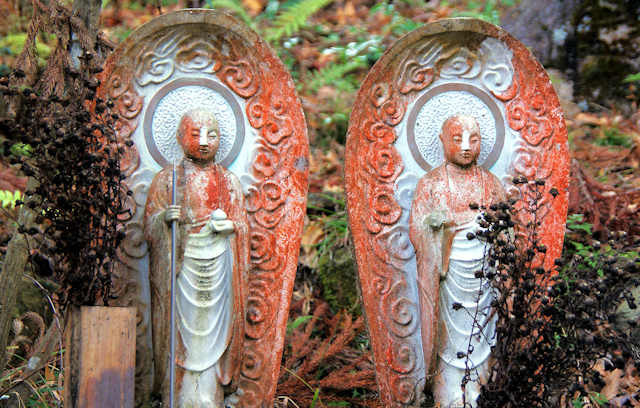 I believe this is a pair of Jizo. 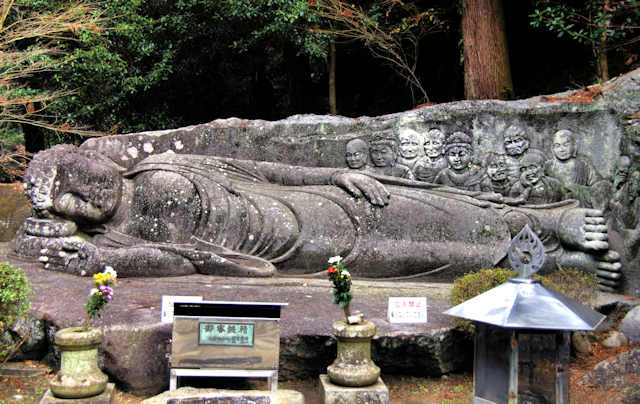 Statues of the reclining Buddha are relatively rare in japan compared to other Buddhist countries. This one is about 9 meters in length and carved in situ. Almost certainly this is Kannon. 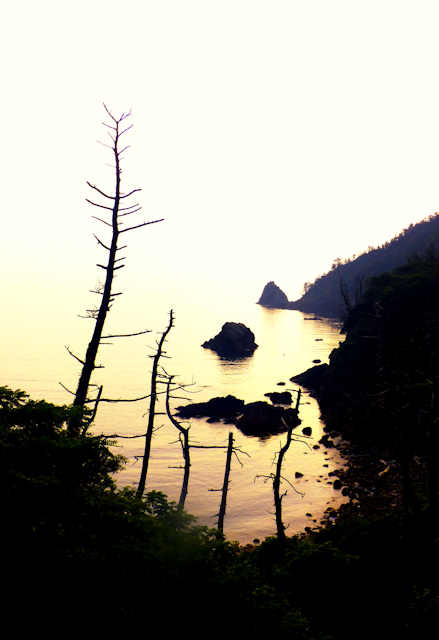 For the first day of my walk along the Shodoshima Pilgrimage I chose to walk the small peninsula that jutted out into Sakate Bay. My guesthouse was there and temples 4,5,& 6 were all on it. 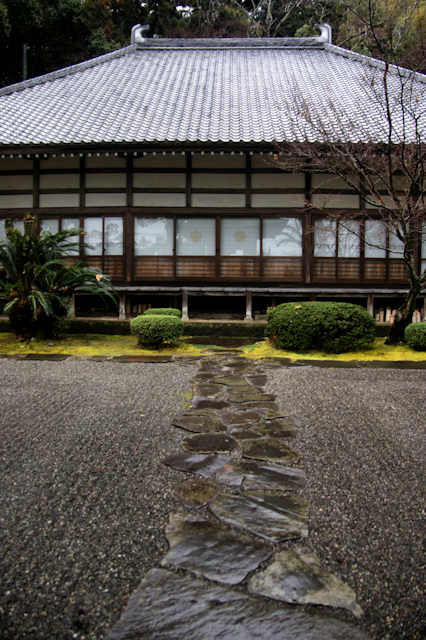 From number 5, Horikoshi-an, my plan was to walk a narrow road that went round the south side of the peninsula. A couple of years ago it had been closed by a landslide but I figured it would be open by now. 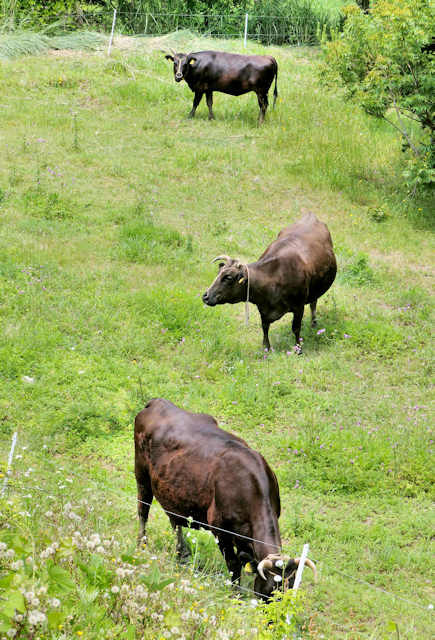 However at Horokoshi-an the signs pointed to a trail that headed up the hillside and over a pass. The most direct route, but involving a 160 meter climb. 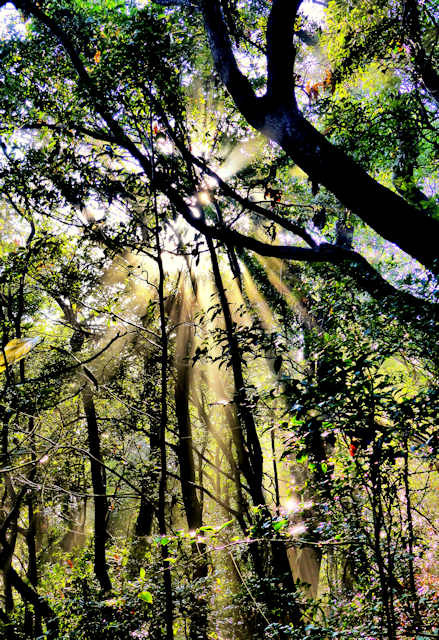 I am glad I took it as as I reached the pass the woods were filled with golden shafts of sunlight piercing the last of the morning mist. 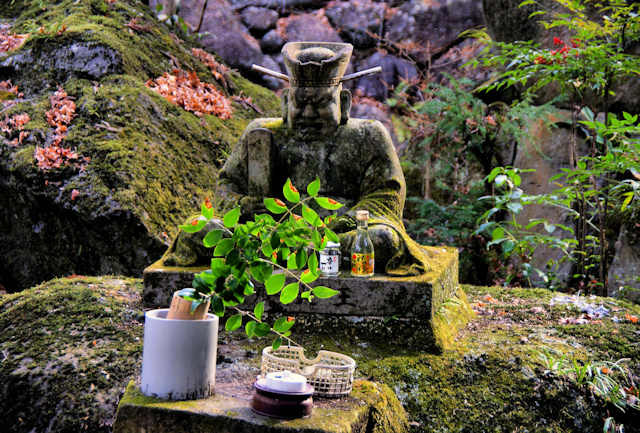 At the pass was a small wayside Jizo, and then the path descended quickly. 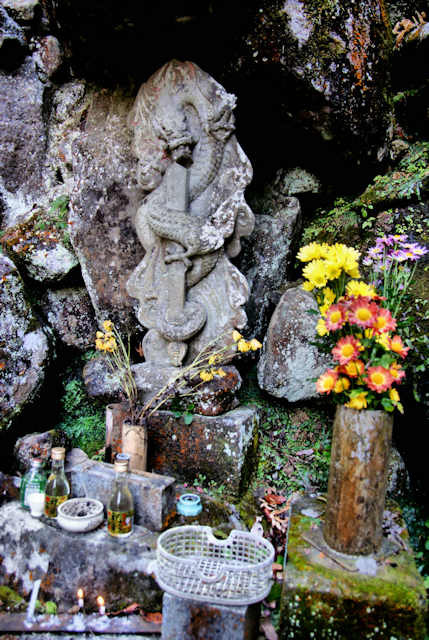 Part way down and right next to the bubbling stream was a small structure containing two small statues of Fudo. 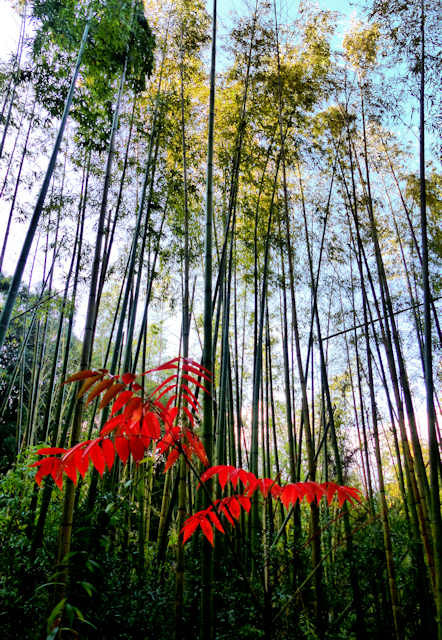 The trail carried on down through some thick stands of bamboo before coming out of the forest above the fishing village of Tanoura. 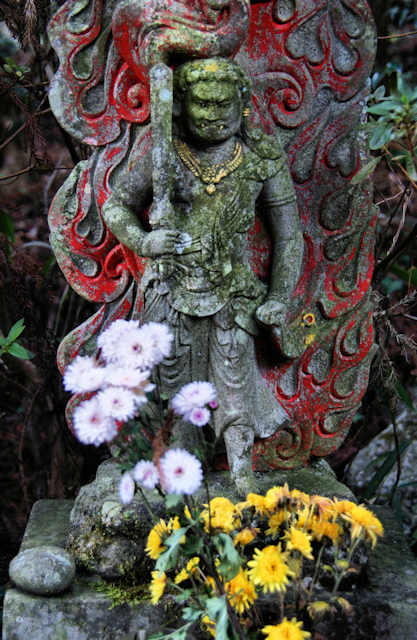 Jingo-ji is temple 21 on the Kyushu Pilgrimage and is located on Mounbt Hachimen south of Nakatsu. 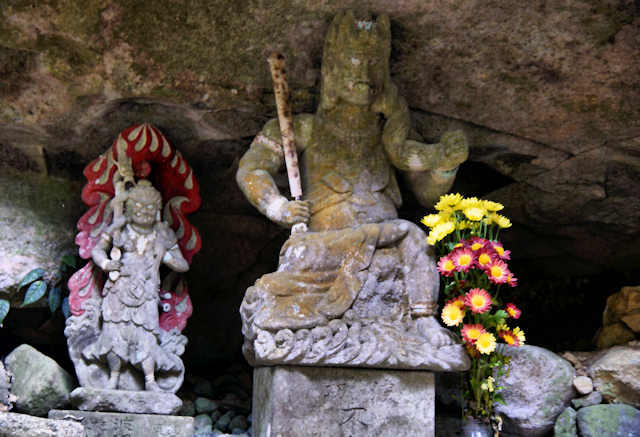 There is a lot of statuary on the mountainside including a rather unusual reclining Buddha, and I will post some of them later, but for now some of the many Fudo Myos statues there. 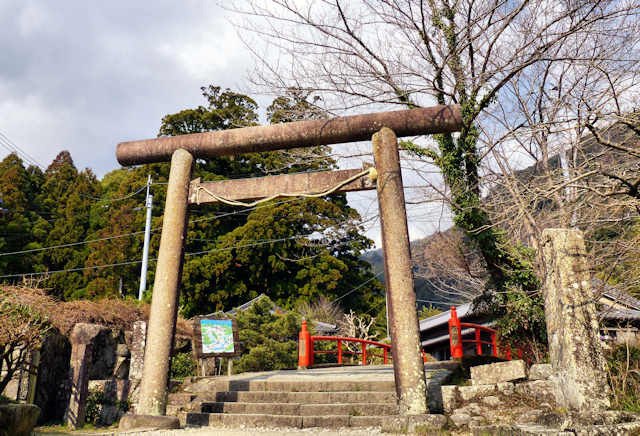 It was a Shugendo site for mountain ascetics, and in the shrine below was a massive Tengu mask. 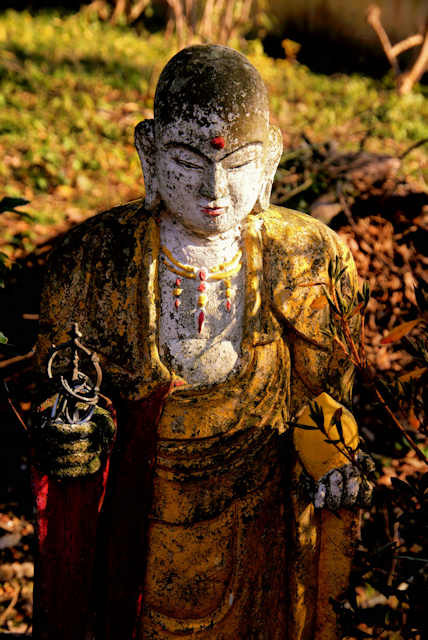 There are several small waterfalls where ascetics would practise austerities. 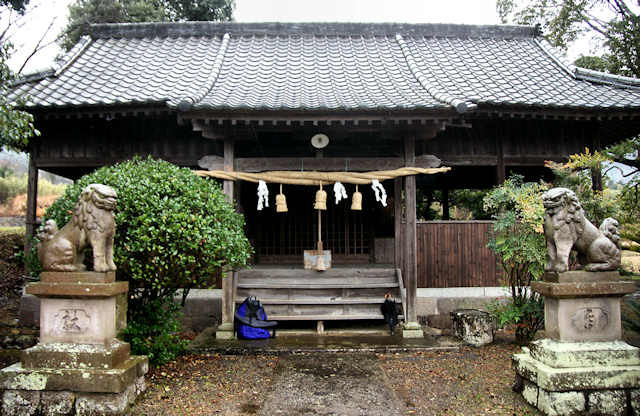 On the first day of mny walk along the Chugoku Pikgrimage I had visited temple number 3, but rather than take the most direct route to the next temple I chose to take a detour so I could visit a couple of sites unrelated to the pilgrimage, the first being the Shizutani School. 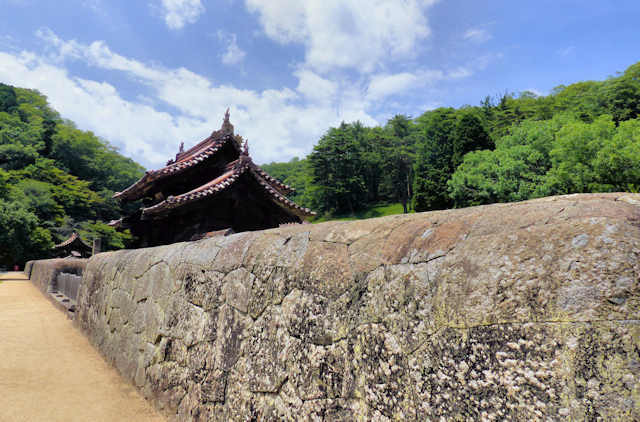 Fronted by an unusual Chinese style wall, the school was founded at the end of the 17th Century by the lord of the domain Ikeda Matsumasa as one of his schools of Confucian studies. 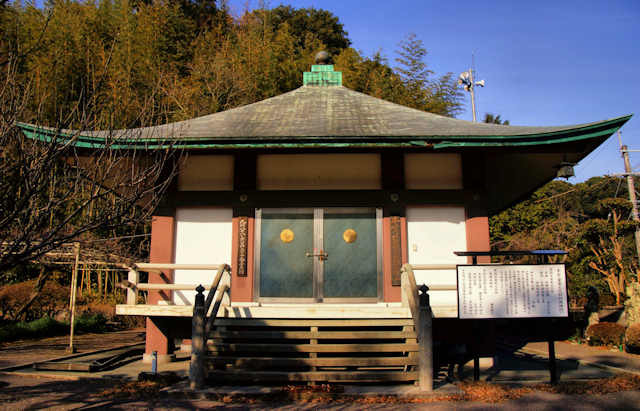 The main lecture hall/auditorium is registered as a National Treasure, and other buildings include a shrine to Confucius and a shrine to Ikeda Matsumasa. 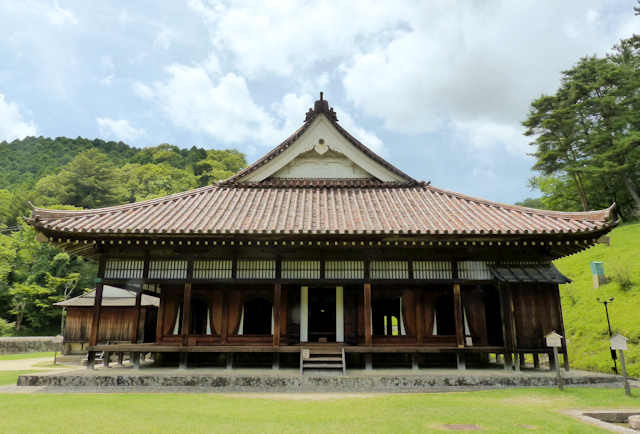 The school enrolled students from the samurai class as well as sons of village headmen and is therefore known as one of the first public schools for commoners. 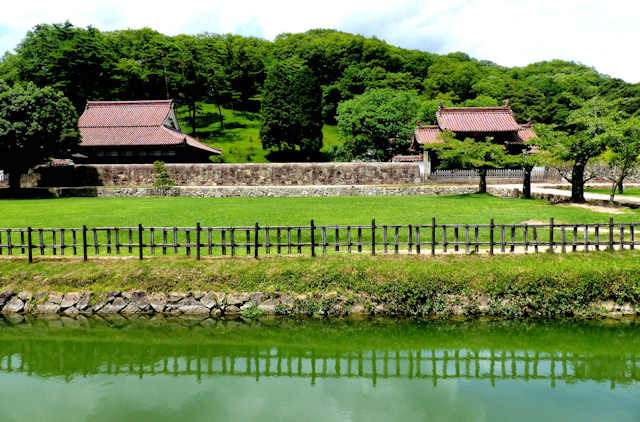 More detsails and history can be found in a longer article I wrote over at Japanvisitor.